Not all scissors are made equal, and if you’ve ever tried to cut fabric with scissors that have been used for cutting paper, you’ll know what I mean! There are many different kinds of scissors, including scissors for quilting. Choosing the best quality is important, good tools = good job! Many of you will be using some kind of fabric cutting device however, you do still need good pairs of scissors for some tasks. Of course, you can go to a dollar store and buy some but I don’t recommend this. I’ve tried it and it’s a false economy, a few cuts and they break or go blunt! Dressmaking Scissors – My own scissors are Kai 5210 8-inch Dressmaking Shears They were bought as a birthday present 9 yrs ago and are still as sharp as the day I bought them. 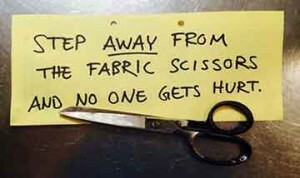 One reason for this is I’ve NEVER lend them out, no one gets near my sewing scissors. I just know they’d get used for cutting paper, not good if you want to keep them sharp! 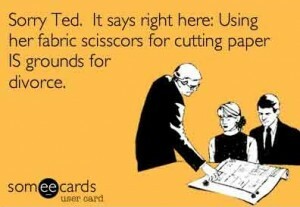 There’s been many a fight originating from using fabric scissors for other things! If you only have one pair of scissors in your toolbox then it should be good quality dressmaking scissors. 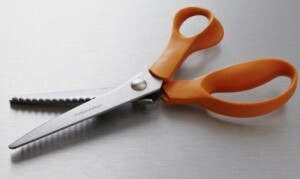 Fabric Snips – Fiskars excel in making snipping scissors for all tasks and do a range of soft touch handles, much easier on the hands if you use them a lot. The Fiskars 8 Inch Ultimate Craft Snip are great for when the fabric cutter doesn’t quite give a clean cut. 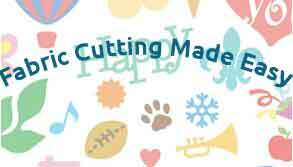 The craft snip cuts right to the end so can snip to complete the cut. The blades have a titanium coating, 3 times as hard as stainless steel, so are durable and long lasting. The serrated blades help to keep the fabric in place while you cut. 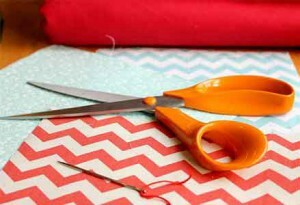 Quilting Snips – If you’ve ever made a rag quilt then you’ll understand what I mean when I say this can cause blisters! Making 1/4″ snips along every seam can be a painful experience using regular scissors. The Heritage Cutlery 6-1/2-Inch Spring Loaded Rag Quilting Snipscan help you avoid this as you don’t put your fingers inside the handle, but over the top. Then there is the spring loaded action, makes it easy to whiz along those seams snip snip snipping! There’s also locking latch for when they’re not in use. Appliques scissors – These are odd looking scissors with one of the blades looking like a duck’s bill. They are designed this way so you can push the edge you want to cut up to the sharp blade. The the “ducks bill” keeps the other part away from the blade. I like the Gingher 6 Inch Knife Edge Applique Scissors because the handles are offset making it easier to see your work. They get very close to the edge so are useful for all kinds of sewing tasks, not just applique. If you sewing a chiffon hem trimming the excess and leaving a neat finish is easy with these scissors. They can also be used for rug making and embroidery. or finishing edges on easily frayed fabric. There are many different makes, but the ones I use are Fiskars 8 Inch Pinking Shears Again, I’ve had these for over 9 yrs and they’re still perfect for cutting. I find them easy to use because of the ergonomic handle design, my wrists don’t start to ache a few minutes into using them! They are high-grade steel and cut right to the edge. Thread Nippers – If your sewing machine doesn’t have an automatic thread cutter then you should have a pair of these. I find it almost impossible to thread a needle with thread that hasn’t been cleanly cut. If you hand quilt then you’ll also need a pair for that. Mine are the Gingher 4.5 Inch Knife Edge Thread Nippers, a lovely pair of Gingher 4.5 Inch Knife Edge Thread Nippersthread snippers giving a clean cut every time. Finally, here are a few tips on caring for your scissors. Good quality scissors will last a lifetime if they’re cared for properly. Don’t use them for any other purpose than your sewing. Wipe clean with a soft cloth after us. Keep the pivot screw oiled (wipe off the excess) and keep it clean. Keep them sharp by taking the to a professional scissor sharpener. You can get sharpening gadgets for home use, but they don’t do such a good job. I know this seems like a lot of pairs of scissors for quilting, but having the right tools for the job makes things much more seamless (pardon the pun!). How many pairs of scissors do you have and which are your favorites? Great article, Kathy! Very good information about the best scissors for quilting! It’s easy to see that you have much experience with this and I would certainly follow your advice. I also love that you explain how to take care of these tools. Thank you for sharing! Hi Michelle, I’m glad you enjoyed the article. Having the best scissors for quilting is like having decent tools for any job. 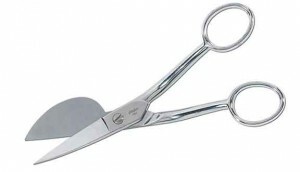 Caring for your scissor properly is important, it’s a big investment and you want that investment to last a long time! I am a knitting fanatic but have an interest in all things craft related so found your website a very interesting read! I have bookmarked you for future reference when I am ready to branch out and try something new, like quilting! I now know which scissors I need for quilting too! Hi Kathy Scissors for quilting, or scissors for any type of sewing are the next most important thing after the sewing machine, I think. Thread nippers! I’d never heard of them before I read your post, but what a terrific idea. I absolutely cannot thread a machine with a frayed end of cotton. My favourite scissors in my toolbox are a pair of pinking shears given to me by my grandmother in law, who wanted a coin in exchange so as not to “cut” the friendship, a Yorkshire custom I’d never heard of before. There must be other superstitions around scissors – perhaps other readers might have heard of some ?? Ah, a girl after my own heart, you have to be a sewer to really understand the whole scissors thing! How wonderful to have your grandmother in law’s pinking shears, I bet they are beautiful scissors! I’ve never heard of that custom before either or superstitions surrounding scissors, you’ve given me an idea for another article, thank you! My grandmother used to make quilts for everyone. I still have 1 or 2 she made years ago. She had quite a little business going on too. People would come from all around to get her to make them a quilt! I would get her some of these nice scissors if she was still around! How wonderful you still have quilts your grandmother made, I no longer have mine, unfortunately. I can imagine her quilts would have been very popular and a great way for her to earn some extra income! Very informative on quilting and the accessories you need. I can tell that you are knowledgeable about your craft. I love your website design. How long has quilting been a hobby of yours? I remember when I little my father’s mom used to crochet things all the time, like blankets, homemade calendars for the year. I am sure you will have much success with you site! As a man that is married to a crafty woman, I learned very early that yes there are different scissors for different jobs. If only I had read this earlier, I may have not got in so much trouble. Thanks for sharing, you laid it out all so well. Ah yes Chris, I bet you took her craft scissors and then she couldn’t find them! When my children were younger and living at home they’d plead for my beautiful sharp quilting scissors “I only need to cut this little bit of paper”! I lost count of the amount of scissors I had to buy for them! A truly fascinating insight into the World of scissors! I had no idea there were so many specialised types available. As you say, right tool for the right job is definitely the way to save yourself from problems. I have an Aunt who is interested in starting quilting, but she suffers a bit with arthritis in her hands. Are there any types of scissors or specific manufacturers who have developed something that would be most suitable for her? I also liked your tips about caring for scissors – I will now make sure I never use someone else’s fabric scissors to cut paper!! Thanks John, I have a bit of a thing about scissors and own many pairs, all to be used for a specific tasks! The best kind of scissors for arthritic hands are the spring loaded ones, only one action is needed for the cut as opposed to two. The “Quilting Snips” in this article operate this way, but most of the good manufacturers have some spring loaded scissors, like the Fiskar Easy Action range. I knew there were different types of scissors, but I didn’t know there were so many just for quilting. So these scissors can only be used quilting and sewing? It does look like big an investment for someone who is not a professional. Of course, for a professional the tools are the success of the trade, and it makes every sense to buy the right ones and care for them! Have different scissors for quilting is much like having a range of spanners or screwdrivers, not one size fits all! Of course, with scissors, you don’t have to use them just for quilting but they can soon get blunted if they’re used for other things like cutting paper. I know my husband used to use my screwdrivers for prising open paint tins, not good! It does seem like a big investment, but you can buy them gradually. The best ones to start with are a pair of fabric snips and a pair of dressmaking scissors. Hi, what a great article! I have a pair of good scissors but made the mistake of using them to cut paper – and just as you warn in your article, it has made them blunt. I wish I had read your article ages ago! Do you think it is better to get my current Fiskars pair sharpened, or to start again with a new pair? 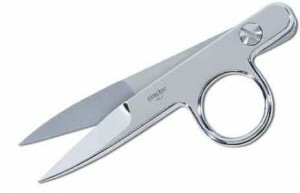 Fiskars are good quality scissors and will sharpen well, so I’d do that rather than purchase a new pair. If you’re like me though, you’ll use it as an excuse to buy a new pair, I have a pair of scissors for every purpuse! I never understood until I was much older and had tools of my own – precision tools to work on electronics and medical equipment – why my mother was so dang mad at me for using her “sewing scissors” to cut out cardboard to make a fort. Heck they looked like normal scissors to me, now I know better. The right tool for the right job is a fact that not only makes the job itself easier (provided you let the tool do the work) but gives me a greater sense of pride in my craftsmanship. I mentioned I fix electronics and medical equipment. I also build things in my woodshop and help my daughter with all of her American Girl craft projects. I am teaching my daughter the finer points of using and caring for tools – she’s having trouble with ‘every tool has it’s home’ as I continually pick up after her. I guess that’s normal for a nine year old. About cutting – my mom gives my daughter scrap fabric and my lil one makes doll dresses. I tried to use our kitchen scissors – nope didn’t work. I used my lineman scissors – nope but made some cool jagged edges. I was ready to try out my teeth but instead am taking my kid to Michaels for scissors. Sorry to drone on like this but one last thing – My brother and I bought my mother a $1500 applique machine with all the bells and whistles and some training classes a few years back. I feel I’ve paid for the scissors I ruined when I was a kid. Never come between a woman and her sewing scissors Eric! I would say you have definitely paid for those scissors, does you Mother still do much sewing? I have never done any quilting myself, but I am very surprised at how many different types of scissors there are to use in quilting.If I ever take up this hobby I will know just where to go for some great information about the best tools for quilting . Being a man who likes to use good tools I enjoyed reading your article Kathy! Quilting is no different from any other hobby David. If you’re a fishing man look at the choice of rods you have to choose from! Scissors for quilting are one of my “things”, I have to have quality, no point trying to snip and cut with blunt ones.